Elijah (Standard Hebrew: אֱלִיָּהוּ Eliyyáhu'), also known as Elias (New Testament Greek: Hλίας), was a ninth-century B.C.E. prophet of the Hebrew Bible whose name has been variously translated as "whose God is the Lord," "my God is the Lord," and "my God is Jehovah." Elijah is considered to be one of the great prophets of the Abrahamic religions because he warned people against forgetting God's commandments and advised the Israelites to repent of their polytheistic ways. The Bible also describes Elijah as a divinely-inspired wonder worker, and a forerunner of the coming messiah. It is believed that the prophet Elijah shall return to Earth prior to the millennial Day of the Lord, and many Jews expect Elijah to help restore their nation. The further development of Elijah as a harbinger of the arrival of the Messiah is developed throughout later Jewish and Christian traditions. As a result, Elijah is a shared prophet in Judaism, Christianity and Islam alike, also in Mormonism and other new religions. He is a deeply respected figure by the followers of many world religions who see Elijah as an archetype who stands for both justice and the hope of restoration. In Judaism, Elijah is famed as both a wonder-worker and as a foreteller of the coming messiah. He first appears in the Hebrew Bible as a figure who challenged the idolatrous ways of King Ahab, who ruled the Israel in the first half of the ninth century B.C.E. 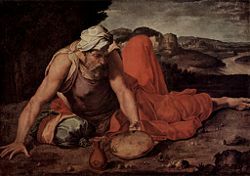 Ahab was primarily notable for his rejection of the Israelite Temple tradition in favor of devotion to Baal, a Canaanite/Mesopotamian fertility god. Ahab's reign was characterized by a period of droughts, epidemics and famines—all presumed to be caused by an aggrieved YHWH (following the Deuteronomistic theology of the Books of Kings). It is in this context that Elijah emerges, delivering a stern warning to King Ahab and advising him to repent his polytheistic ways. After having delivered his message to the apostate king, Elijah retired (at the command of God) to a hiding-place by the brook Cherith, beyond the Jordan, where he was fed by ravens. When the brook dried up, God sent him to live with the widow of Zarephath who supported him for two years. During this period, the widow's son died and it is said that he was restored to life by Elijah (1 Kings 17:2–24). Afterward, Elijah met Obadiah (an officer of King Ahab) and bade him go and tell his master that Elijah was there. The king came to meet Elijah, and reproached him as the "troubler of Israel" for criticizing his public conversion to the religion of Baal. In response, Elijah proposed that he and the priests of Baal should each make public sacrifices to their respective gods, and, based on the perceived reception of these offerings, determine whether Baal or the Israelite God was the true divinity. The contest took place on Mount Carmel, where the Baalite priests were, due to divine intervention, unable to light their sacrificial fires; Elijah, on the other hand, was able to light soaking wet wood at the altar to YHWH. This miracle convinced those watching that Baal was false and that the YHWH (יהוה) was the only true God. As the gathered crowds toasted the Israelite God's victory, Elijah ordered that the prophets of Baal be put to death. However, Jezebel, the wife of Ahab and chief proponent of the religion of Baal, became enraged at the fate that had befallen her priests and threatened to have Elijah killed (1 Kings 19:1–13). Elijah escaped to Beersheba and was visited in the night by an angel, who offered him heavenly food for his flight into the wilderness. Having partaken of the divine provision, he went forward on a forty day trek to Mount Horeb, a journey that numerically and thematically paralleled Noah's forty day sojourn in the ark, Moses' forty years of wandering in the desert, and Jesus' forty days in the wilderness after baptism. Upon reaching the mountain, Elijah was visited by the Lord YHWH, who, significantly, appeared not in earthquakes or thunderstorms (in the manner of Baal), but in a "still, small voice." This theophany teaches the inwardness of God's voice, that believers should look for God not in the mighty power of nature but in their own conscience. The word God spoke by that voice was pregnant with power: God would shake up the political order by having Elijah anoint Hazael as king over the Arameans (Syria), Jehu as king over Israel, and Elisha as his divinely chosen prophetic successor (1 Kings 19:13–21; cf. 2 Kings 8:7–15; 9:1–10). After his return to human society, Elijah continued to attack and criticize the apostate reigns of Ahab and (later) his son, Ahaziah. Particularly in the affair of Naboth's vineyard (1 Kings 21), Elijah stood for social justice and the rights of small landholders against royal prerogative. Tradition suggests that, at this time, he may have been in retirement on Mount Carmel but he was informed that his ascent to Heaven was drawing nigh (2 Kings 2:1–12), so he went down to Gilgal and met his successor Elisha, who he had anointed some years before. Elisha became solemn at the thought of his master leaving him, and refused to be parted from him. The two traveled to Bethel and Jericho, and crossed the Jordan, where the elder prophet (in another Mosaic parallel) divided the waters of the river. When they arrived at the borders of Gilead, it is said that "Elijah went up by a whirlwind into heaven." Elisha, watching his mentor disappear into the heavens, was able to catch his predecessor's mantle as is fluttered to the ground. In this way, Elisha was delivered "a double portion" of the older prophet's spirit (2 Kings 2:9), as the receipt of the older prophet's mantle alludes to the preference shown to the first-born son in the division of the father's estate (Deut. 21:17). Based on the belief that Elijah resides in heaven (one of only two biblical figures said to do so, the other being Enoch), later rabbinic lore gives Elijah the role of interlocutor with God, who sits near God's throne and can tell the sages what God is thinking. Another reference to Elijah in the Hebrew Bible can be found in 2 Chronicles 21:12–15. Because of the difficult chronology, some suppose him to represent a different person than the prophet—a second individual who lived in the time of Jehoram, to whom he sent a letter of warning (compare 1 Chron. 28:19; Jeremiah 36), and that he acted as a prophet in Judah. By way of contrast, the Tishbite was a prophet of the northern kingdom. However, there does not seem any necessity for concluding that the writer of this letter was some other Elijah than the Tishbite. The events of 2 Kings 2 may not be recorded in chronological order, and thus there may be room for the opinion that Elijah was still alive in the beginning of Jehoram's reign. It is believed that the prophet Elijah shall return to Earth prior to the millennial Day of the Lord. The depth of the impression made by Elijah "on the mind of the nation" of Israel can be judged from the prevailing belief that Elijah would again appear for the relief and restoration of the country. One example of this belief is articulated in Malachi (4:5–6): "See, I will send you the prophet Elijah before that great and dreadful day of the Lord comes. He will turn the hearts of the fathers to their children, and the hearts of the children to their fathers; or else I will come and strike the land with a curse." The further development of Elijah as a precursor to the arrival of the Messiah (and sometimes as harbinger of the apocalypse) is developed throughout later Jewish literature, including the Talmud and various Midrashic sources. None of the prophets of the Hebrew Bible is so frequently referenced in the New Testament as Elijah. The priests and Levites said to John the Baptist (John 1:25), "Why, then, dost thou baptize, if thou art not the Christ, nor Elijah?" Paul (Romans 11:2) refers to an incident in the prophet's history to illustrate his argument that God had not cast away His people. Further, James (5:17) uses him an illustration of the power of prayer (see also Luke 4:25; 9:54). Many parallels can be found between the characterizations of Elijah and John the Baptist. Both figures dramatically and sternly critiqued worldly authorities that they saw as morally or religiously bankrupt (1 Kings 18; 2 Kings 1; Luke 9:8). We can also see parallels in their connection with the wilderness, their long retirements in the desert, the sudden, startling commencement of their respective ministries (1 Kings 17:1; Luke 3:2), and even in their dress (hairy garments and leathern girdles about the loins (2 Kings 1:8; Matthew 3:4). The equation between the two is overtly made in the Matthew 11:11, where John the Baptist is described as the Elijah that "was to come" (Matthew 11:11, 14). Similarly, Jesus testified that the prophesied coming of Elijah was realized in none other than John the Baptist (Matthew 17:12, see also 16:14; 17:10; Mark 9:11; 15:35; Luke 9:7, 8; John 1:21). The millennial climate of the early common era was likely responsible for this identification; the Hebrew world was in uproar and it was assumed that the end times were nigh. Indeed, in describing Elijah's literal appearance at the Transfiguration (Matthew 17; Mark 9; Luke 9), the gospel writers do not ascribe any feelings of shock to the disciples. They were "sore afraid," but (apparently) not surprised. Some Christian theologians of a conservative, pre-millennial perspective believe that Elijah must eventually return to physically die here on Earth, perhaps as one of the "two witnesses" described in the Book of Revelation (11:2–12). This plays into many eschatological scenarios. Conversely, conservatives who come from amillennial or preterist positions probably see John the Baptist himself, in the time of Jesus, as a fulfillment of this expectation. Christian theologians of a more liberal persuasion, on the other hand, tend to interpret Elijah's eschatological significance in a less literal sense. The Biblical tales of Elijah, which describe him as both a millennial prophet and as a divinely ordained wonder worker, have defined a figure that can be used in multiple contexts and to various ends. Perhaps this accounts for the enthusiastic acceptance of the Elijah tradition by other religious faiths. For example, Islam sees Elijah as a prophet, with the Turks believing that Ilia (Elijah) and Job were buried at Eyyup Nebi, near Viranşehir. Likewise, members of the Church of Jesus Christ of Latter-day Saints also acknowledge Ilia (Elijah) as a prophet. Latter-Day Saints believe that, in 1836, an angelic Ilia (Elijah) visited the founder of their church, Joseph Smith, Jr. in the Kirtland Temple in Kirtland, Ohio and gave him the sacred power to seal families together. As a final example, the Christian missionaries who converted Slavic tribes found Elijah to be an ideal analogy for Perun, the supreme Slavic god of storms, thunder and lightning bolts (due to the former's ascension to Heaven in a fiery chariot). In many Slavic countries, Elijah is known as "Elijah the Thunderer" (Ilija Gromovik), who drives the heavens in chariot and administers rain and snow, thus actually taking the place of Perun in many popular beliefs. The figure of Elijah (pronounced Ilia (Arabic إلياس)) is also seen as an important prophet of Islam, and is mentioned by name in the Qur'an. Indeed, the Qur'annic account bears many striking similarities to the tale told in 1 and 2 Kings (summarized above). In this account, Ilyas is born into a kingdom fragmented by the death of its wise and pious monarch, whose demise allowed the influence of Satan to become widespread among the people of Israel. The religious people were mocked. The ruler of Samaria killed a large number of learned people. When the evil reached a boiling point, God sent Ilia to reform mankind during the reign of King Ahab of Israel. He tried his best to save the people from polytheism. He forbade them to worship the Tyrian Baal and advised them to ward off evil and worship one God. Unfortunately, his efforts bore no fruit. In response, he appeared before the king and foretold that a severe drought and famine would overtake the kingdom. Ilia added that the Tyrian Baal would be powerless to avert it. The people paid no heed to his warnings and did not mend their ways. The prophecy of Ilia turned out to be true and whole of the kingdom experienced famine. The people began to starve. After three years, Ilia prayed to God to show mercy to the famine stricken people. They acknowledged the authority of God and felt regret. Soon after the rain ended the drought, God lifted his curses. After this Ilia was directed by God to call upon Al-Yasa to be his successor. Ilia did this and disappeared mysteriously. In the theology of the Church of Jesus Christ of Latter-day Saints, the name/title "Elias" is not synonymous with Elijah and is often used for people other than the Biblical prophet. According to Joseph Smith, "The spirit of Elias is first, Elijah second, and Ilia (Messiah) last. Elias is a forerunner to prepare the way, and the spirit and power of Ilia (Elijah) is to come after, holding the keys of power, building the Temple to the capstone, placing the seals of the Melchizedek Priesthood upon the house of Israel, and making all things ready; then Messiah comes to His Temple, which is last of all"
People to whom the title Elias is applied in Mormonism include Noah, Gabriel (Angel) (considered to be the same person as Noah), Elijah, John the Baptist, John the Apostle, and an unspecified man who was a contemporary of Abraham. However, the tradition also contains references to the Biblical Elijah as well. Most significant of these is an account of the return of Elijah during a Passover service at the Kirtland Temple in April 1836. His appearance was seen as the fulfillment of two prophecies: those of Malachai and of Joseph Smith. This transfiguration experience undergirds many of the messianic and millenial beliefs of the Mormon faith. Indeed, as Shipps argues, "whether or not this experience was mediated by the New Testament, it pointed to the flourishing afterwards of the conception of Mormonism as the restoration of Israel"
In Unificationism, Elijah is seen as a figure who did not complete his mission because the people failed to believe him. He ascended into Heaven in a whirlwind and a fiery chariot before he could complete his divine mission of cleansing Israel of Baal worship. The prophecy of Elijah's return (Malachi 4:5) was to prepare the people for the man who would come to fulfill this unfinished mission. Due to this providential necessity, it is said in the New Testament that John the Baptist was Elijah returned. In this, Elijah prefigured Jesus, who likewise ascended into heaven after his crucifixion, promising to return and bring judgment upon all evildoers. Unificationism uses the New Testament idea that Elijah "came again" as John the Baptist to explain that the second coming of Jesus will be another person fulfilling the role and mission of Jesus' work left undone because of the crucifixion. Furthermore, when John the Baptist refused to accept the identification with Elijah (John 1:21) as Jesus' forerunner, thus undercutting Jesus' messianic claim, Jesus took the role of the second coming of Elijah on himself, not least by performing miracles similar to what Elijah had done. Apparently this impression of Jesus was believed by some—that he was the return of Elijah (Mark 6:14-16; Matt. 14:2). ↑ S. M. Segal, "Elijah: A Study in Jewish Folklore" (New York: Behrman, 1935). ↑ Teachings of the Prophet Joseph Smith, 340. ↑ LDS Bible Dictionary s.v. Elias Retrieved January 20, 2008. ↑ Jan Shipps, "Mormonism: The Story of a New Religious Tradition" (Urbana, IL: University of Illinois Press, 1985), 82. ↑ John P. Pratt, "Symbolism of Passover and of Elijah's Return," The Ensign 15 (7) (July 1985), 55–64. This page was last modified on 14 September 2017, at 15:26.